Your booking/experience fee includes costume hire and photoshoot for up to 4 siblings and a complimentary keepsake* image as both a 7×5 print and high resolution digital photo (same picture). We’re sure you’ll love your pictures and want to buy more, so we have some special offers for you to pre-order (at checkout) and you choose them straight after your photoshoot (we will refund your photo order if you are not completely satisfied), or you can choose, order and pay at the event. Here is a link to our products www.thefairiesandelves.co.uk/bookings/prices/, unfortunately because we are mobile we are unable to offer picture viewings at a later date. 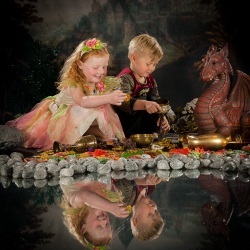 We welcome you to book online at www.thefairiesandelves.co.uk/bookings/shop/ (up to 4 siblings per booking), if you have more than 4 children please call us first, we can usually accommodate you. To give a fair and equal opportunity to all, we only allow one photoshoot per family, per 6 months and reserve the right to cancel and refund a booking that falls within this time. Should you need to cancel your experience and give us 48 hours notice your booking fee will be fully refunded. We have a great selection of costumes available, but please be aware we do not stock all costumes in all sizes and some promotional pictures may contain children wearing their own costumes, so by all means do bring along your own to be sure. All images shown are for illustration purpose only, actual product may vary from images shown in promotion. Allow approximately an hour and a half for your full experience, which includes some waiting time. We support & donate to East Anglia’s Children’s Hospices. *The Keepsake photo is chosen by you, from the first few photos taken, our ‘keepsake setup’ (designed to be printed and taken away on the day); and NOT from the creative lighting setups, as these pictures are for additional purchases and need to go to our post processing team ‘the magic department’ for their creative and magical input.